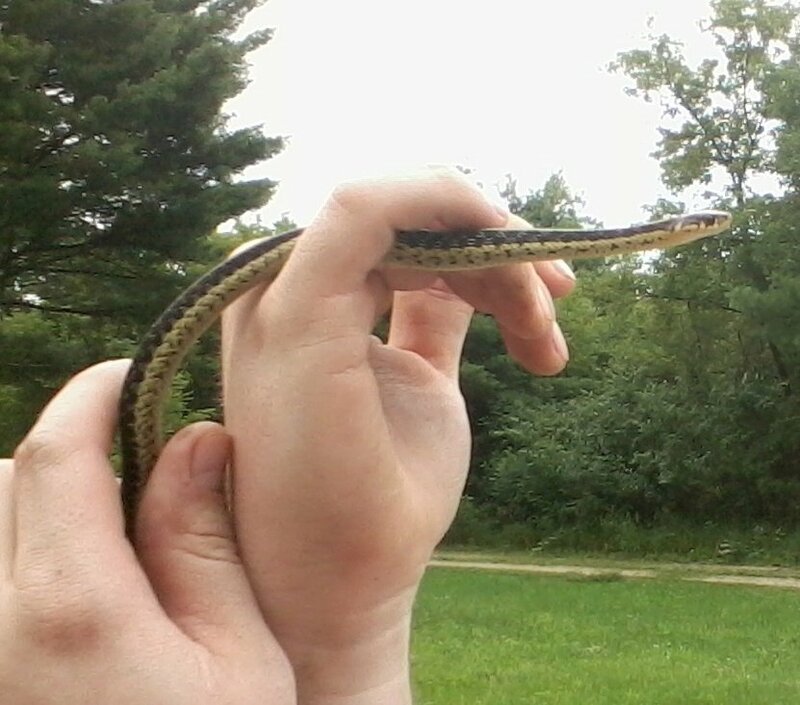 So a few days ago, Eric, one of Mike’s best friends, rescued a small garter snake from under his lawnmower while, well, mowing the lawn. He and his wife, Amanda, fell in love with the little guy but let him go to live his natural life. Eric and Amanda are similar to Mike and I in the fact that they also love animals and have a crop of their own lilpets, including a reticulated python named Stenga. Well, the baby garter snake awakened in Eric and Amanda the all consuming desire to get another snake. This lead to Snake Fest 2011. Thursday was Eric’s day off and since the rest of us have, well, flexible schedules, Thursday was the day. Eric and Amanda came over to our place. Since we have just recently moved, this was also an opportunity to have a look around the new apartment. Also, Amanda was able to handle our own little snake, Clyde, and remind herself why she wanted a little snake – because they are super cute, of course! Mike, Eric and Amanda started the search at an independent store only a few blocks away from our new place. Aquarium Pets, LLC of Oshkosh is a quaint little store that looks like it is family owned and operated, since we always see the same people working there and they have lots of family pictures of pets stuck up all over the place. They have a wide variety of fish, both salt and fresh, and they are in excellent condition. As a person who shops a lot of specialty pet stores, I can tell you that not all stores are equal and while a store may have a good selection, it doesn’t necessarily mean the animals are well cared for. Aside the obvious ethical concerns in wanting to avoid supporting business owners who do not take care of animals, it is particularly important that fish be well cared in order to give them the best chance at life when they reach my tank at home. Unfortunately, since Eric was looking for something very unique, Aquarium Pets did not have the right one. They had a few beautiful snakes but none appeared to be “the one”. I will be back there shortly, however, as I want to set up a goldfish tank now that we are settled in the new apartment. They had some large, beautiful Ornadas that are exactly what I’m looking for, but that is for another post. So it was on to the Just Pets in Appleton. Just Pets is another specialty store that has a lot of fish, both salt and fresh, but also has an impressive collection of reptiles and small animals. This was the spot but now we had the opposite issue of too many snakes to choose from! Eric and Amanda found several contenders, looking first at no fewer than six snakes. Finally we narrowed it down to three and then two. 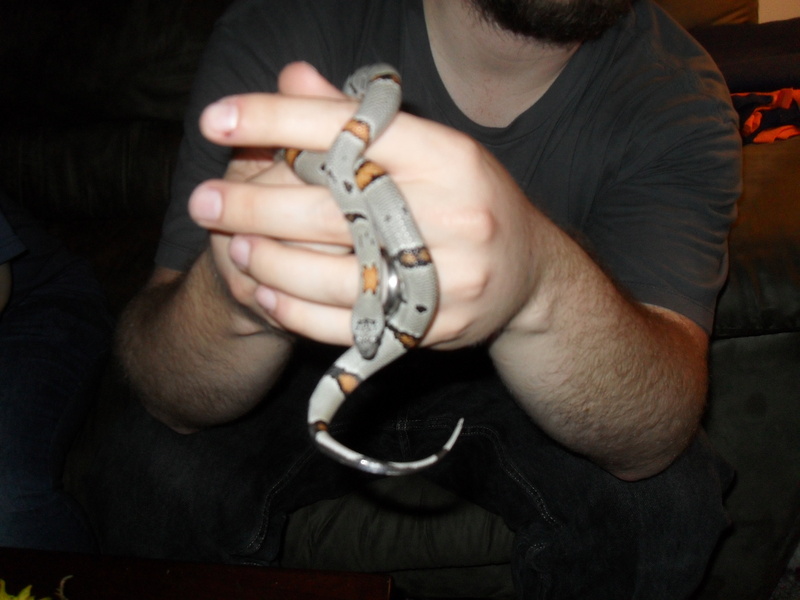 They handled the two they were most interested in, a gray-banded kingsnake and a oketee, or natural colored, corn snake. The store owner was very helpful and Eric and Amanda were able to handle both snakes as well as ask some questions about them. We had a decision to make so we left the store to get lunch, promising to be back soon. Over lunch at Olive Garden (so yummy!) the four of us discussed what we liked about both of the snakes and the ups and downs of both choices. The winner was quickly chosen and a delicious dinner was had. No name for Baby Snake Bestul, yet. There seems to be some disagreement about the proper choice. We’ll keep you posted! Also, Mike and I picked up some new rainbow fish for our tank, so a good day all around! That’s all for now! Happy pet parenting to all of you! UPDATE: Eric and Amanda chose Gandalf the Grey as a name. Perfect. We decided on Gandalf for a name. Thanks for the amazing day. Snakefest 2011 was an absolute blast!